Mumbai: Shares ended 0.47% lower on Friday, after gaining for two consecutive sessions, on mounting worries over economic growth, with stocks expected to stay under selling pressure next week as well. 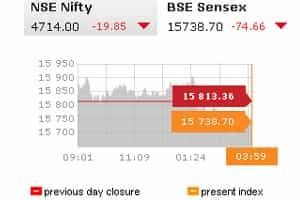 The main 30-share BSE index closed down 74.66 points at 15,738.70, with 19 of its components in the red. It, however, gained 1.6% for the week -- its first rise in three weeks. “Foreign institutional investors have been selling everyday in our market. It’s just that the global market have been largely positive and have been supporting our markets," said Neeraj Dewan, director at Quantum Securities. Foreign funds have been net sellers for nine straight sessions to Wednesday, data from India’s capital markets regulator showed. They have been net sellers of local stocks worth more than $500 million so far in 2011, a far cry from record net inflows of more than $29 billion in 2010. Indian markets broke their two day winning streak on Friday. Mint’s Krishna Merchant looks at what drove the losses and what stocks performed the worst. “There are really no domestic positive cues likely to come," Dewan said. “Everyone is looking towards RBI (Reserve Bank of India) to take some action, I don’t think they should wait till the next policy to take action". The BSE index is most likely to stay in a 15,000 to 17,000 range for the next six months, said Nirmal Jain, chairman of India Infoline group. The ballooning fiscal deficit is a big concern and markets can recover if reforms get a push after state elections next year and if the central bank eases rates at its policy review in January, Jain said. Brokerage CLSA cut its forecast for Indian economic growth to 6.7% for the current fiscal year from its earlier projection of 7.3%, as high interest rates take a toll, with policy inertia and corruption scandals hurting confidence. Top lender State Bank of India and No 2 lender ICICI Bank fell 1.3% and 0.7% on profit taking. They had rallied 2.9% and 3.7% on Thursday. Pantaloon Retail, the country’s largest listed retailer, rose as much as 4% after the finance minister said a plan to give foreign supermarkets access to its retail industry is still a government priority and has not been shelved. The stock pared gains later in the session to close up 0.22%. ABB Ltd, a unit of Swiss engineering group ABB , rose 3.4% after its parent received an order worth more than $900 million from Power Grid Corporation to supply a transmission system. Energy giant Reliance Industries, which has the heaviest weighting on the main index, closed down 1.08%. The 50-share NSE index ended down 0.42% at 4,714 points. In the broader market, there were 1.3 gainers for every loser on volume of about 523 million shares. Fresh signs the giant US economy is gaining momentum drove major world stock markets and the euro higher. • Private shipbuilder Bharati Shipyard’s shares closed up 1.36% after rising as much as 3.6%. Reuters had reported that its lenders plan to restructure $1.5 billion of loans. • Monnet Ispat and Energy rose as much as 8.65% to Rs389 after the company’s board decided to buy back shares at a price of up to Rs500 a share. The company said it would spend Rs100 crore for the buyback. The stock ended up 1.5%. • Suzlon Energy rose more than 3% after the wind turbine maker got new orders worth Rs935 crore. The stock closed up 1.6%. • Shares in construction and infrastructure firm Punj Lloyd rose as much as 4.88% after it said on Thursday it has won two orders -- a $54 million road project in Kenya and an Rs810 million project. The shares closed up 2.13%.